Squash is such a fall speciality. It is featured in recipes and in decorations. It evokes feeling of fall, warmth, and comfort and there are SO many varieties. As Steph and I wandered through the farmer's market, we admired many squash and finally settled on a buttercup squash. It was a new one for both of us. While I prefer delicata and perhaps butternut squast over the buttercup, I did really enjoy this recipe. 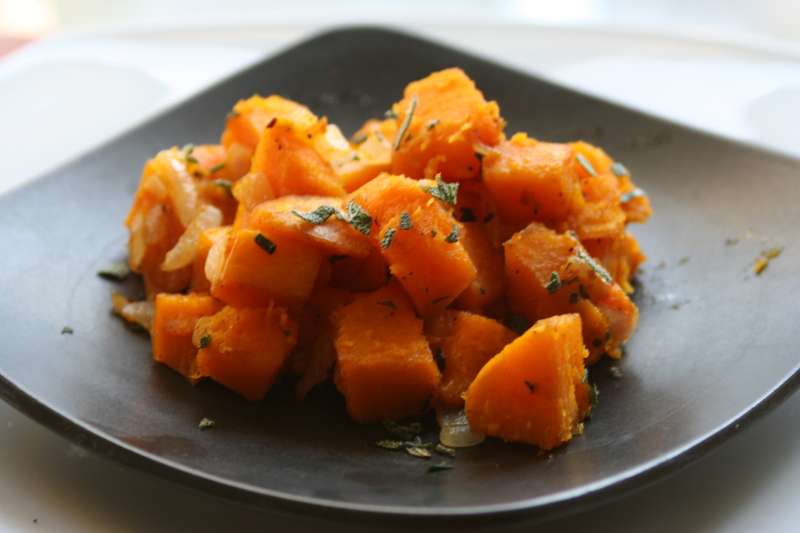 You could successfully substitute your favorite squash in this recipe. If you are looking for a new side dish or a different way of preparing squash, then you will surely enjoy this. It is simple but delicious and certainly fancy enough for your holiday feasting. Peel and cube the squash. Toss with olive oil, 1 tsp. melted butter, salt and pepper to taste (about 1/2 tsp salt, 1/4 tsp. pepper). Roast until tender about 15-20 minutes. Melt 2 Tb. butter in a sauté pan. Add onion and cook until tender. Add sage and rosemary and a little more butter if needed and sauté until fragrant and onion is lightly browned. Add roasted squash and gently toss to coat with butter onion mixture. Garnish with more sage if desired.